Blam Entertainment Group is proud to offer this complete list of LaserDisc releases for Star Trek®. Included here are all editions from the US, Japan, the UK, France and Germany. Missing are a handful of titles from Spain, the Netherlands, Italy, Hong Kong Taiwan and the Philippines. Any help you can provide will be greatly appreciated. We have also included VHD editions from Japan and CED editions from the US (as they were active at the same time as LaserDisc). We have elected to NOT include other formats (DVD, HD-DVD, UMD, BD, UHD and so on) because the studios have reissued titles numerious times on those formats in multiple configurations. Episodes not actually issued on LaserDisc are also included so the episode lists are complete, and will be represented as how they would have appeared on LaserDisc. The first 10 theatrical films are also represented. This site has been enhanced with Star Trek specific fonts. They are available for download by clicking here. Unzip this file to create the individual .ttf (True Type fonts) sets and follow the instructions that came with your specific operating system to install them. Once installed, the pages will load using these new fonts. CBS Studios is the home of Star Trek®. The official Star Trek site on the web includes lots of Star Trek stuff, but frankly I don't really visit it much. Although I do get inundated with spam for buying stuff from the Star Trek Store. 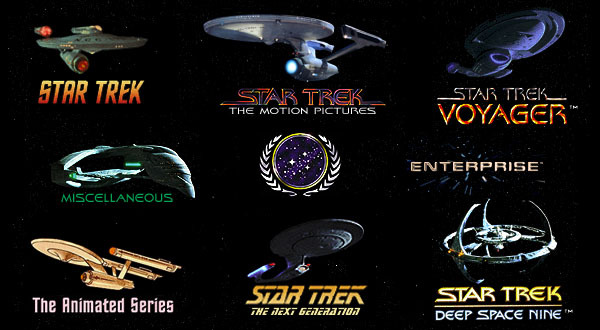 Star Trek® is a Registered Trademark and all related marks are Trademarks of CBS Studios.